Transform your Business, Income and Life. Grant Cardone is a New York Times bestselling author, international social media influencer, the number-one sales trainer in the world, renowned speaker and real estate investor. He owns five companies with annual revenues exceeding $150 million. He is a regular guest on Fox News, Fox Business, CNBC, and MSNBC. He also is a contributing writer for Forbes, Success Magazine, Business Insider, Entrepreneur.com and the Huffington Post. 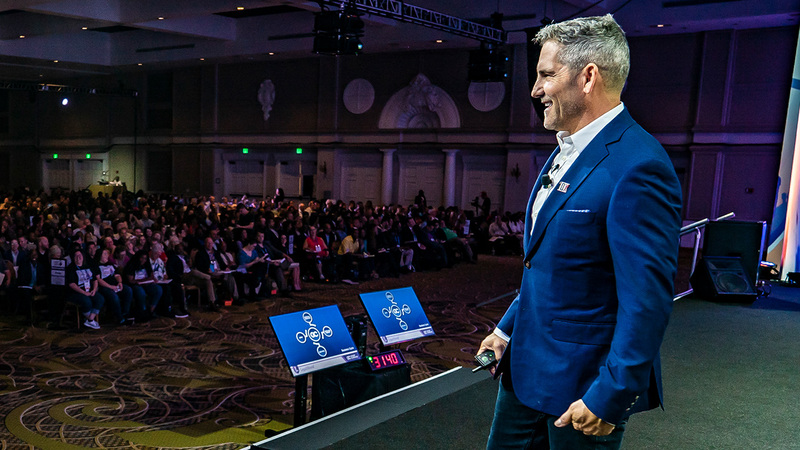 Mr. Cardone takes a cutting-edge, disruptive approach to sales, marketing, consulting, social media and investing to give the everyday person an opportunity to better their life, increase their income and experience the success that he has. Are you ready for a HUGE 2019? Get ready to flip the switch, ignite your fire, and make your dreams a reality this year! End the year with a bang with personal coaching from Grant Cardone. Learn from Grant’s experience and industry knowledge on what to invest in, simple steps to get you started buying deals, and more advanced multifamily strategies and methods. Grant breaks down the secrets of the wealthy and what you must do to become a millionaire. Learn the steps, tools and set your goals to 10X your income. Understand what financial independence is, what it means, and why it’s so important to you. You’ll also get powerful self-assessment tools to review your money situation and create the right action plan. Get the right financial information to finally improve your situation. Over seven hours of how to create your plan to become a millionaire. A multitude of negotiation strategies for any situation to finish any deal – personal or business. The official recording from the Las Vegas Growth Conference. Over 22 speakers giving advice, examples, stories and information on helping you transform your business, income and life. A step-by-step guide to understanding and implementing your finances and how to create wealth in your life. You’ll know how to change the way you approach success and business to go from just getting by to prosperity. Nine training events (plus eBooks) with over 30 hours of live seminar material packaged in one premiere collection. This course will walk you through each of the nine steps with an explanation and application so that you can incorporate these strategies into your own business and personal life to gain financial freedom. Get the training tools you need to handle sales objections to become a better closer and a top producer. Gain authority over your sales process and dramatically increase your closes. This is over 10 hours of video with Grant Cardone personally reading each chapter. It's time to get your money right. Things are changing fast. Improve the condition and life of yourself and others. I will show you how to make millions of dollars talking on the phone. Grant Cardone will show you what you must do to Create a 10X Super Life. A great life is more than just finances, you want greatness in all areas of life. The secret is vital to increasing your income and expanding your business. Get the confidence, courage and the commissions a real closer deserves. Make success your duty. Over 5 hours on Finances, Business, Social Media and Your Life! These sales training strategies will show you how to succeed in sales at a 10X level! Over 3 hours of exclusive content, presentation and discussions on what truly makes a salesperson thrive. The Best Seating in the World, Direct to your phone, tablet, computer or TV, Access to VIP Expert Panel and Q&A. Eight Growth Conference Speakers like Lewis Howes, Les Brown and Russell Brunson give marketing insights and discuss the latest trends and how you can use them to your advantage. Speakers from the popular Las Vegas event share their secrets, thoughts and the steps they took and are still taking to achieve and maintain the ideal life. This 10X course gives you in-depth information, training and coaching on the 10X movement. 5+ Hours of Grant Cardone personally reading through and expanding on The 10X Rule. Grant does a BRILLIANT job describing the steps it take's to built wealth. America has income problems, not expense problems. When majority of people are living with basics they struggle to afford, they cannot cut but need to invest in increasing their income. That vehicle is the commitment to raising the daily job income, but also the income that your investments create every year.